Eric Wooden was working at a post office for three years until he woke up one day in 2013 and decided he wanted to start designing t-shirts. 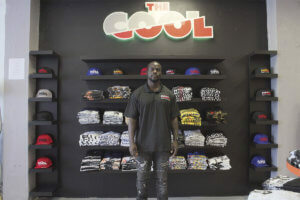 Five years later, the 29-year-old celebrated the grand opening of his store “THE COOL” in Liberty City off of 62nd Street and 7th Avenue last week. THE COOL, a clothing line that Wooden describes as having an urban style, was born out of his love for fashion. However, his passion did not make the process of establishing a brand easy for him. When he first started, Wooden began going to trade shows and passed out flyers in South Beach, Brickell, Aventura and other areas of Miami. It wasn’t until 2015 when he really started to get noticed by stores. The clothing store COOL Js began ordering shirts from him, and so did other stores, Wooden said. In 2016, Wooden had seen enough profit from THE COOL to leave his job at the post office. The ultimate goal for Wooden was always to open his own clothing store. However, it wasn’t until he started taking courses with the Miami Bayside Foundation, a nonprofit aimed at advancing economic development in the city of Miami, that the goal became more attainable. Wooden took part in the free training Miami Bayside Foundation holds two to three times a year that targets minorities and women in the city of Miami. He also received a loan from the foundation to aid in opening his store and to purchase the t-shirt printer. Jane Justiz, a worker for the foundation’s loan program, said the free training is primarily for small business owners to help them expand. Some of the courses are on the topics of understanding your business, mission statements and branding, market analytics, production, social media, human resources, sales and more. “At the end, all the students present to lenders, and they have to create their own financial package, basically what they would need to get a loan,” Justiz said. one will begin in the summer. Participants must attend at least eight out of 10 of the sessions in order to earn a certificate of completion. Wooden said the courses he took with the foundation helped him a lot. Wooden also attends Miami Dade College and is working on a degree in entrepreneurship. Erica Wooden, Eric Wooden’s twin sister, said she and their parents are proud of her brother. Both Erica Wooden and Terry Jones, Eric Wooden’s brother who also helps him to design the t-shirts, came to support him during the grand opening. At this point, Eric Wooden has not only accomplished his ultimate goal of having his own store, but he is also living out the answer to the question, why THE COOL? To apply for the small business training, visit MiamiBaysideFoundation.org.